Posted on October 14, 2012 by David H.
Two hundred years ago, here in the US, the War of 1812 had just begun, and with it came turmoil and tumult. However, this was also a time of great ferment and excitement – the Academy of Natural Sciences of Philadelphia, an institution dedicated to the advancement of discovery, had just been founded in March of that year, and fewer than ten years prior to that, this country had expanded to reach from sea to sea, from the Atlantic to the Pacific, what with the Louisiana Purchase and that followed soon thereafter by Meriwether Lewis and William Clark’s expedition out west, to explore those newly acquired lands. Clark and Lewis, respectively, made maps and sent back ethnographic specimens, and birds, and plants – and the vast majority of those plants are now here in Philadelphia, having arrived, by various means, at the Academy of Natural Sciences. Two hundred years ago was a time of troubles, but also of growth, expansion, discovery, here in the new world, and that sense of discovery, and some of those specific discoveries, still exist today. Over in Europe, there was also war two hundred years ago – at this time, 1812, it was the Napoleonic wars, with armies sweeping back and forth across the continent, ravaging as they went. However, within a few years, Napoleon quite literally met his Waterloo, and so all of his employees, the soldiers that worked for him included, had to find new lines of work. 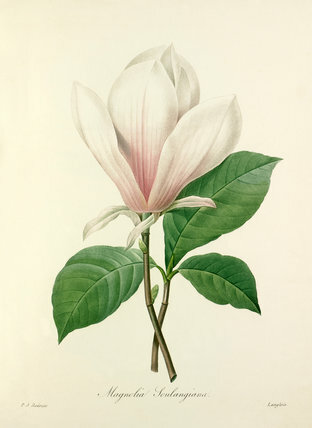 As Neil G. Treseder points out in his book “Magnolias” (1978), “It should be pointed out here that the date 1826 apparently referred to the initial flowering of the particular hybrid seedling which Soulange-Bodin had selected to perpetuate his name.” Therefore, the actual act of hybridization would have taken place a fair bit earlier, probably around 1820, given that it took about 8 years (more about that below) to get seeds from the plant that came from this initial hybrid. Redouté was the plant illustrator of the 19th century – he worked with Empress Josephine at Malmaison (her garden), and Francois Andre Michaux, and his rose illustrations are justifiable legendary and a touchstone for rosarians to this day. This book, the Choice of the Most Beautiful Flowers, was his selection of the most beautiful flowers that existed. And this included a new magnolia – Magnolia soulangiana, which he had gotten right from the source (On p. 11 of Redouté’s Choix des plus belles fleurs, it is noted that the flower came from Soulange (“Elle a ete obtenue par M. Soulange-Bodin, a Fromont“)). “A new species of the Magnolia has been produced by the Chevalier Soulange Bodin, President of the Linnean Society of Paris. “A very handsome variety of the Yulan Magnolia, obtained, as we are informed by the Chevalier Soulange-Bodin, in his Garden at Fromont, from a seed of M. Yulan, which had been fertilised by the pollen of M. obovata. This was a new plant, and a beautiful plant – and horticulturalists in centuries past, as they do to this day, respond enthusiastically to novelty, and to beauty, and the horticulturalists of England responded to the introduction of Soulange’s magnolia by buying them up. By 1832, this magnolia was in the US, as is indicated from its listing in the Periodical catalogue of greenhouse shrubs, vines, herbaceous plants, and bulbous roots: cultivated and for sale at the Linnean Botanic Garden, Flushing, near New York, William Prince & Sons, Proprietors that year (thanks to Maggie Graham of the California Garden & Landscape History Society, for guiding me towards that reference, and to Janet Evans, of the McLean Libray of the Pennsylvania Horticultural Society, for guiding me to Ms. Graham’s guidance). You’ll note that the price of this plant is $8/piece – as Joel Fry (of Bartram’s Garden) has pointed out, this is extremely expensive; he notes that most trees or shrubs at that time were 50 cents or a dollar per plant, and that a rare and/or new plant might be $5 or so, and therefore the price, eight dollars, is indicative of the rarity and the novelty of the Magnolia soulangeana, when it first arrived in America – excitement surrounded it, as did the dollars. In that 1836 catalogue, there wasn’t a price listed for Soulange’s magnolia (the other plants in the catalogue had prices associated with them), and from this we can infer also the rarity and novelty of this plant – it wasn’t even clear to the Carr’s how to price it, it was so new. But might it have been in Philadelphia earlier than 1836? At the Wyck Historic House and Garden in Germantown, there is a saucer magnolia – you can see its once magnificent size represented by the girth of its base that now pokes a bit up out of the ground. I rarely see saucer magnolias with trunks of the width of the Wyck example, and so I can’t judge clearly its age, however, based on general extrapolation from what I’ve seen of younger trees, I wouldn’t feel like I’m putting my neck too far out by saying that this is a 19th century planting and perhaps, even, possibly, one that might date to the earlier half of the 1800s. The Wyck house dates to the 17th century, but the key part of its history to our story here is its 19th century owners, Jane and Reuben Haines. Both were ardent lovers of plants, gardens, the natural world – Reuben was Corresponding Secretary of the Academy of Natural Sciences of Philadelphia from 1813 until he died (in 1831), and Jane made a garden at Wyck of stunning beauty and depth. She was creating this garden in the 1820s and 1830s – that is, when Magnolia soulangeana first came to be, and first came to the US. And so we find a Magnolia soulangeana at Wyck that is quite large, indicating its great age, and we know that Jane Haines was buying materials in from the “Prince Nursery” (i.e, the Linnean Botanic Garden indicated above), and we know that they, the Prince nursery, had this tree very early on, and that they, the Prince nursery, quite possibly (likely, even, one might say) had the original cross of this plant, the one that was derived from Soulange-Bodin’s garden – and we know that Jane Haines was planting plants at Wyck in the 1830s. And so, while this is all, at this point, evidence that is suggestive without telling, it does lead one to think that this tree at Wyck may well be one that directly connects to Soulange-Bodin’s garden – not a cousin, not just a sibling even, but possibly an identical twin of the flower illustrated by the illustrious Redouté. We are still looking for further evidence, hopefully more conclusive, that this is (or is not) the case, but until then we can build a story of this tree created by the hand of former soldier, who turned his swords into plowshares and developed one of the greatest gardens of France, and therefore of Europe, whose tree ultimately found its way across the Atlantic to the yard of a Quaker, a pacifist, here in Philadelphia. Having followed years of war, but also times of exploration and discovery, this peaceful garden in Germantown, that still exists to this day, holds not just memories, but living history of a time past gone, but still alive. But it is not quite the original planting that is still alive, I should say – this saucer magnolia had aged, as do all things, even trees, and it had rotted quite a bit on the inside (which is why I can’t count the rings to see for sure how old it is), and so the main trunk had to be taken down recently. However, there are new stems coming up and out from its remains, stems that are being carefully tended by Elizabeth Belk, the current gardener at Wyck – and she is also putting her efforts towards propagating this tree, by air layering, so that this magnificent plant that may well be immediately descended from the first of the saucer magnolias can live on, and perhaps even live elsewhere, too. By the 1840s, the Magnolia soulangeana was quite common in the US. In the 1841 and 1850 editions of Andrew Jackson Downing’s Treatise on the Theory and Practice of Landscape Gardening, there is a “list of hardy and showy shrubs which are at the same time easily procured in the United State.” Included in this list is the Magnolia soulangeana, whose common name is given as the “Soulange Magnolia”; it is also indicated as being a large shrub, and being purple. It being noted as a shrub indicates its relative novelty – these plants hadn’t grown into their full tree size yet. This tree was becoming quite popular and it became quite common, too, and this has continued on, up until the present. Today, the saucer magnolia, as this tree is generally now called, is extremely commonly seen as a park or lawn planting, and there are dozens of cultivars available (as is noted by Michael Dirr in his Manual of Woody Landscape Plants (1998)). If you go to the northwest corner of Rittenhouse Square, in downtown Philadelphia, there are two lovely ones that have been there for a few decades (the one to the east is less than 40 years old, the one to the west a bit older than that – this is indicated from their respective presence/absence in planting maps of the park, one from the 1960s and the other from the 1970s). And if you go pretty much anywhere in the city, this one or others, you will see the saucer magnolia flowering brightly in the spring – it is a hardy grower with beautiful flowers, and so it is commonly planted. And so we have a tree that is now extraordinarily common – there are dozens of cultivars, they are planted all over in parks and yards in cities and suburbs, all over, and it has even naturalized here, in the US. But this is not always how it was – this is a tree, a hybrid, whose parents traveled separately to Europe from Asia, to come together in a garden not far from Paris, to be united by a man who had soldiered across Europe but retired to live among flowers, a tree that then went on, this beautiful and strong plant, to enter into commerce at the highest price, at some point to be bought by a Quaker, a pacifist, in what was no longer quite the new world but was certainly new to this plant, to grow here in Philadelphia, and to then, to go on, to recently fall apart from the inside, but to then to grow anew, and to continue to survive, with help and care, to live on in a changed world that is everchanging onwards. This entry was posted in Historic plants, History of landscapes, History of plants, Nurseries and seedhouses, Plant biography - botanists, Plant biology - botany, Saucer magnolia, Trees: biology and history and tagged Germantown, landscape history, Magnolia, Trees, urban forest, Wyck by David H.. Bookmark the permalink. Thanks for the super interesting historical tour. Magnolias are certainly among the most beautiful of all ornamental trees. It’s fantastic that we can enjoy them all around Philadelphia. So, it seems that in days gone by there was a bit of confusion as to what two species of magnolia were cross bred to produce the alexandre soulange, but if what I have been led to understand is correct, then the parent plants were the Yulan and the Mulan magnolia, from China.